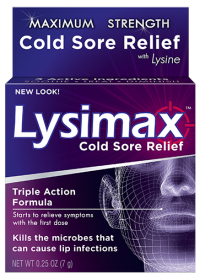 Maximum strength LYSIMAX Gel provides temporary relief of pain and itch associated with fever blisters and cold sores while protecting against infection. With three active ingredients, cold sores don't stand a chance. What are the active ingredients in LYSIMAX? LYSIMAX contains Benzalkonium chloride 0.13%, Menthol 1% and White petrolatum 97%. What is LYSIMAX used for? LYSIMAX is for the temporary relief of pain and itching associated with fever blisters and cold sores; first aid to protect against skin infection in minor cuts, scrapes and burns; and helps prevent, temporarily protects and helps relieve chapped or cracked lips. What are the directions for LYSIMAX ? Apply LYSIMAX to affected area not more than 3 to 4 times daily. Massage gently until absorbed into the skin. Can LYSIMAX be used inside the mouth for canker sores? As stated on the product package labeling, LYSIMAX is for external use only, so it is not intended to be used inside the mouth. We recommend speaking with a doctor or pharmacist regarding treatment advice for canker sores. How long can I use LYSIMAX? As stated on the product package labeling, we recommend stopping use and speaking with a doctor if the condition gets worse, persists for more than 7 days, or clears up and occurs again within a few days.